Logging is the recording of intended execution steps in the software lifecycle. It makes troubleshooting, monitoring and debugging of software easier and smooth. There are many java based logging frameworks available like Log4j, Logback, Java Logging(JUL), Apache Common Logging for implement logging functionality in Java frameworks. Log4j2 is an upgraded version of the Log4j framework. 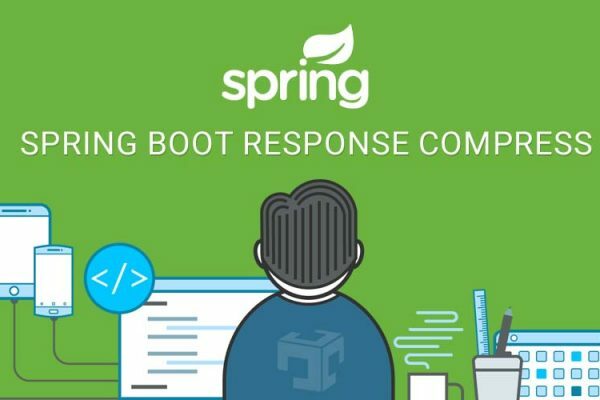 In this tutorial, we will learn how to setup Log4j2 logging framework with Spring Boot project. Add spring-boot-starter-log4j2 dependency in pom.xml or gradle file. If you are using spring-boot-starter-web artifact in spring boot then you need to exclude spring-boot-starter-logging dependency in pom.xml as per below xml. Create Controller File where Logging can be performed. Logging can be performed in any Java file but for ease, we have taken Controller for different levels of logging test. Add the path of Log4j2 configuration file which guide spring boot log4j2 framework for configuration. Create log4j2.properties configuration file in the resource folder. Log4j2 can be also configured by other types of files like XML, YAML, JSON. 1). Logger: It captures logs like debug log, error log, etc in defined scope. 2). Appender: It appends log to configured appender like the console, file, JDBC, etc. 3). Layout: It prints logs using the configured format like PatternLayout, HTMLLayout, etc. Here first we configure only Console logs as shown below. Add below configuration into log4j2.propeties file. Here, we have used the console as logging output Appender, configure appenders = console. You can use other appender like a file, rollingfile, JDBC, etc. a level is for Log level like DEBUG, ERROR, etc. n for a new line. For Logger configuration, we can set the whole system logging level by rootLogger.level. There possible values for logging level are DEBUG, ERROR, FATAL, TRACE, WARN, ALL, INFO, OFF. For example: If your log level set to WARN then your logging appender will show you WARN, ERROR and FATAL types of logs. If you want to set the logging level for the particular package then you need to define separate loggers and logger for that. We have set ALL logging level for com.javadeveloperzone.log4j.controller package means all types of logs will be captured from classes that package. Run mvn spring-boot run command and run spring boot application. Open localhost:8080/ url in the browser. If you want to store logging output in the file then you need to add file appender in log4j2.properties file. Append below five lines of appender.file code to log4j2.properties file. Replace last three line of logger.controller in log4j2.properties with given below last three line of code of logger.controller. Using the above configuration logs will be stored in logs/logfile.log. If you want to avoid repetition same of logs in appenders, you can set logger.controller.additivity = false. So, your logs for a configured package will be stored only in logs/logfile.log only, it will not be shown in the console. 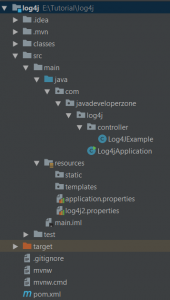 In this article, we learned how to configure Log4j2 in Spring Boot with use of properties file. Main things we need to keep in mind when configuring log4j2 with Spring Boot is selection of appender, layout and logger scope with level.